Do you want to win gold coins, motorbikes, home appliances, and other exciting prizes? 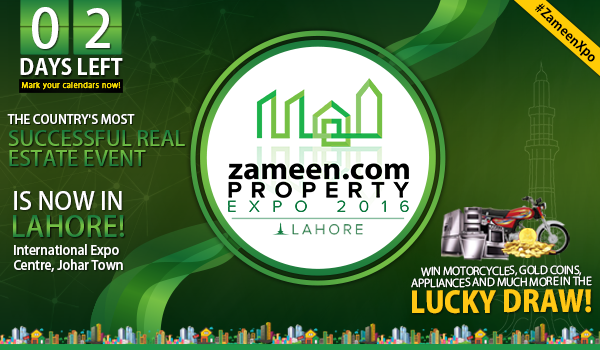 Well, you can if you attend the Zameen.com Property Expo 2016 in Lahore this weekend! Slated to be the biggest and most happening real estate event of the year, this expo is giving you the opportunity to take home amazing prizes by participating in its lucky draw. Besides giving real estate aficionados the opportunity to interact with one another, reputed real estate agents and developers, Zameen.com has ensured that visitors are rewarded for their presence with Wheel of Fortune giveaways and lucky draw gifts. The event is right around the corner and will take place on May 28 and 29 at the Expo Centre in Johar Town from 12:00 p.m. to 10:00 p.m. For the first time ever, Hall 1 and Hall 2 have both been booked as 105 exhibitors have signed up to showcase their projects and services! The venue will also have a dedicated food court offering a variety of the most popular and delectable cuisines and an array of activities that will guarantee non-stop excitement and fun. The expo is an unmissable opportunity to garner indispensable real estate information. You may even be able to settle major real estate deals here. Catering to all property concerns for investors, home owners, genuine buyers, or those aspiring to purchase property in the future, Zameen.com Property Expo 2016 Lahore is the place to be this weekend. Do you remember how the Zameen.com Property Expo 2015 (Lahore) witnessed a football of 45,000 people and 100 deals were struck right there and then? Well, with a much larger number of exhibitors, food vendors such as Subway, Maro Tandoors, and Sweet Tooth, and a plethora of activities including the popular Wheel of Fortune, photo booth and lucky draw, this event is bound to surpass all of that and touch unprecedented heights. So, while all our previous events attained commendable levels of success, the pre-expo response generated this time around suggests that this upcoming affair will truly be extraordinary. Not a major real estate enthusiast? That’s not a problem! Whether you want to casually gather information regarding the latest real estate trends and offers, pursue a particular deal, take a picture in the colourful photo booth, try the mouthwatering cuisine, or simply try your luck at the Wheel of Fortune and the lucky draw, this expo will have something for you. If you don’t show up, you’ll truly be missing out on a grand opportunity. There’s free entry, so you really have no excuse. Don’t forget to come and say hi to us!